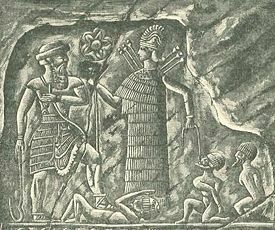 Ishtar as a warrior presenting captives to the king. Ishtar, a goddess of both fertility and war, is the Akkadian name of the Sumerian goddess Inanna and the Semitic goddess Astarte, the three names referring to the same deity in different cultural contexts. She inspired great devotion in the ancient Babylonian empire, as evidenced by the many grand temples, altars, inscriptions, and art objects devoted to her. There were two conflicting aspects to this goddess: She was the deity of fertility and love, but also a jealous goddess who could bring vengeance against individuals, go to war, destroy fields, and make the earth's creatures infertile. Ever young, energetic, and passionate, Ishtar was moody, changing rapidly from love to enmity. She protected her favorites, but brought doom upon those who dishonored her, sometimes with terrible consequences for whole nations. The name Ishtar is likely Semitic in origin, and was identified in ancient times with Canaanite goddess Ashtoreth or Astarte (Biblical Hebrew עשתרת). It is possible that the underlying stem is the same as that of Assur, meaning the "leading one" or "chief." The older Sumerian name, Inanna, means "Great Lady of An"—An (or Anu) being the god of the sky or heaven. Some scholars have suggested that Esther and Mordecai—the heroes of the Biblical Book of Esther—may be Judaized versions of some lost story about Isthar and the Babylonian deity Marduk. Their names, at least, are indeed similar to the Biblical ones. Scholars likewise speculate that Eostre, the Anglo-Saxon goddess of Spring whose name later gave rise to modern the English "Easter," may be etymologically connected to Ishtar. In the archaeological record, Ishtar/Inanna was first worshiped at Uruk (Biblical Erech) in the earliest period of Mesopotamian history. Incantations, hymns, myths, epics, votive inscriptions, and historical annals celebrated and invoked her as the force of life. Ishtar's reign did not normally depend upon a particular male consort. Although sometimes portrayed as subject to higher male authorities, her position in the Babylonian pantheon, in practice, was the highest. Ishtar's genealogy varies depending on the source. She is sometimes described as the daughter of the moon goddess Ningal and her consort, also a moon god, Sin (or Suen), who were the patron deities of Uruk. In other traditions, however, she is the daughter of the distant sky god, An. Later she also is portrayed as his wife. 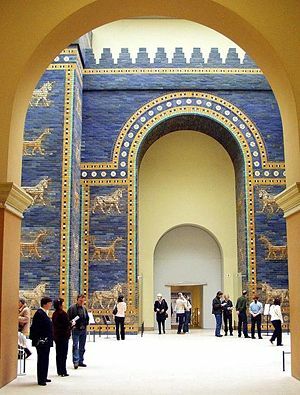 The reconstructed Ishtar Gate, originally located in Babylon, now in the Pergamon Museum in Berlin. inspect its inner wall, the likes of which no one can equal! Take hold of the threshold stone—it dates from ancient times! such as no later king or man ever equaled! In the sixth century B.C.E., the great Babylonian king Nebuchadnezzar II constructed the mammoth "Ishtar Gate" in honor of the goddess. On monuments and seal-cylinders Ishtar appears frequently as a warrior, with bow and arrow or other implements of war. She was invoked as a goddess of battles, particularly among the warlike Assyrians. Before battle, the priestess-vicar of Ishtar would appear before the Assyrian army, clad in battle array and armed with bow and arrow (much like the Greek Athena). At other times, she is depicted simply clad in long robes with a crown on her head and various animals—bulls, lions, owls, snakes, etc.—as her symbol. As the goddess of love and fertility, Ishtar was the guardian of sacred harlots and is described as having sacred priestess-prostitutes. Statuettes have been found in large numbers representing her as naked. In Babylon, she was sometimes portrayed Madonna-like as the mother of the god Marduk. In later times, it should be noted, the priestesses of Ishtar were virgins who were not permitted to marry. Together with the moon god, Sin and the sun god, Shamash, Ishtar is the third figure in a triad personifying the moon, the sun, and the earth. In this trinity, the moon represents wisdom, the sun personifies justice, and the earth represents life force. This triad overlies another: An—heaven; Enlil—earth; and Ea/Enki—the watery deep. Ishtar is generally portrayed as the twin of Shamash. Ishtar also appears on the top panel of the Uruk vase, one of the most famous ancient Mesopotamian artifacts. The relief on this vase seems to show Ishtar/Inanna conferring kingship on a supplicant. Various inscriptions and artifacts indicate that kingship was one of the gifts bestowed by Inanna on the ruler of Uruk. In late Babylonian astrology, Ishtar was related to the planet Venus. As the most prominent female deity in the late Babylonian pantheon, she was equated by the Greeks with either or both Hera and Aphrodite. Roman mythology renders Aphrodite as Venus, and thus the planet is indirectly named for Ishtar. The double aspect of Ishtar as the goddess of both fertility and war may correspond to the difference between Venus as a morning star and as an evening star. Ishtar, by various names, continued to be an important deity until the advent of Christianity in the Roman empire and Islam in the Arabic world and Persia. These monotheistic religions and the civilizations they inspired insisted on the existence of only one deity, a masculine god who jealously commanded that He alone be worshiped. An important myth involving Ishtar is the tale of her descent to the underworld. One of the most striking of Sumerian myths, this story describes Ishtar passing through seven gates of hell into the "Land of No Return." At each gate an article of her clothing and ornaments is removed until at the last gate she is entirely naked. Ishtar then attempts to usurp the throne of her sister Ereshkigal, the queen of the underworld. Ereshkigal, however, "fastened upon her the eye of death" and hangs her—seeming to be a corpse—on a hook on the wall. By intercession of the clever god, her uncle Ea (Enki in Sumerian), Ishtar eventually wins release. According to the underworld rules, however, she must find someone to take her place. Eventually she discovers her beloved husband, Tammuz, seated in splendor on her throne. Enraged, she has him seized and dragged below. She looked at him, it was the look of death. She spoke to him, it was the speech of anger. She shouted at him, it was the shout of heavy guilt: "How much longer? Take him away." Holy Inanna [Ishtar] gave Dumuzid [Tammuz] the shepherd into their hands. Holy Inanna wept bitterly for her husband. She tore at her hair like esparto grass. She ripped it out like esparto grass. "You wives who lie in your men's embrace, where is my precious husband? You children who lie in your men's embrace, where is my precious child? Where is my man? Where? Where is my man? Where?" Ishtar arranges for Tammuz's sister to substitute for him during six months of the year—thus explaining the mystery of the sun's diminishing in winter and growing stronger summer. The story of Ishtar and Tammuz prefigures those of Cybele and Attis, of Aphrodite and Adonis, and of the Egyptian Isis and Osiris—all of them tales of a young god who dies, and a goddess who mourns him. The name of Ishtar's husband, Tammuz, was apparently absorbed as a feature of the calendar by the Jewish religion during the Babylonian exile. In both the Babylonian and the Jewish calendar, Tammuz is the fourth month, that of the summer solstice, when, in Mesopotamia, the harvest could begin. Ishtar makes important appearances in the Epic of Gilgamesh, the world's earliest epic poem. The opening chapter of the story describes the glories of Uruk and praises Ishtar's temple there. Hearing of the existence of the wild man Enkidu, Gilgamesh does not go himself to subdue this fierce creature, but sends Shamhat, the most skilled priestess of Ishtar, to "civilize" him. In another chapter, Ishtar proposes marriage to Gilgamesh, but he declines, knowing that her previous mates have met tragic fates. Insulted by his rejection, Ishtar demands that her father, An, send the Bull of Heaven to punish Gilgamesh, despite her knowledge that this act will bring famine to the land. When Gilgamesh and Enkidu slay the bull, Ishtar and her priestesses mourn the creature's death, while the men celebrate. than they fill the sea like so many fish!" In the story of Gilgamesh and the Huluppu tree, Ishtar plants this sacred tree in her garden, where it is guarded by the "snake which knows no charm." Eventually the tree grows very large and Ishtar wishes that someone will chop it down and make various items for her from its wood. Gilgamesh complies, both slaying the snake and making timber of the tree. Later, some of the objects he made for Ishtar were dropped into the underworld. Gilgamesh cannot reach them, and so Enkidu volunteers to retrieve them. A version of this story also appears as the twelfth tablet in the Epic of Gilgamesh itself. One of the hymns about Ishtar describes her mythic battle against the great mountain Ebih. This story praises the goddess' powers of courage and war. Described as the "Goddess of the fearsome divine powers, clad in terror," Ishtar determines to punish the mountain for refusing to show proper humility. The king of the deities, Ishtar's own father An, warns her against her quest. Ishtar, of course, proceeds anyway, and wages a mighty battle against Ebih. She summons a tremendous storm to her aid, eventually seizing Ebih, slaying him with her dagger. "Mountain range, because of your elevation, because of your height, because of your attractiveness, because of your beauty, because of your wearing a holy garment, because of your reaching up to heaven, because you did not put your nose to the ground, because you did not rub your lips in the dust, I have killed you and brought you low." Other stories of Ishtar also exist, and many more must have been lost as the priests of the monotheistic religions sought to eradicate even the memory of this mighty, passionate goddess. The Jewish Encyclopedia. Ashtoreth. Retrieved November 28, 2007. Myths of Ishtar and Tammuz. The King Worships at the Altar of Ishtar. This page was last modified on 6 March 2018, at 23:20.